Where others have tried and failed, a local automotive coil manufacturer in Nigel has succeeded in creating what it claims to be the world’s first server drive application (or ball and claw) cold coiling line: a virtual reversal of the old hydraulic hot coiling line. Because the system can be programmed using the supervisory control and data acquisition (scada) system, the line is more economical, boasting dramatic reduction in change-over times between recipes, as well as reduced scrap, human error and man-time expenses. The company invested R15 million in machinery, robotics, and software and chose to standardise the entire plant on Adroit. Attempts were underway in Japan to perfect this technology, but it was not until the local automotive coil manufacturer commissioned the line in August 2006 that it became a viable technology. This pioneering move has resulted in a diversified strategy for the company going forward. A company spokesman says: “It is a new technology in South Africa about which little is known. We aim to put it in the global market, diversifying the company from an exclusive original equipment manufacturer (OEM) to a global leader in the sale and implementation of this process.” The spokesman for the company is a PhD candidate for his work on this ground-breaking process. The rate of production is approximately one coil every 15 seconds. With this capacity and the improved reliability of the cold coil line, the company won a contract to produce suspension coils for the new Toyota line of 133L vehicles launching in 2007 for the export and domestic market. “The accuracy of the robotics and the resulting reduction in previous problems caused by human error have resulted in a boom in this type of technology in the automotive industry,” says the spokesman. In this application, Adroit forms the operator, providing intuitive access to the 27 different types of coils that can be produced by the cold line. The touchscreen makes it simple for operators to see the code for each and select the desired recipe, which includes compressing distance, load window and more. These recipes are stored in a PLC and accessed via the scada HMI. When a new recipe is selected using the scada, the system auto-updates appropriate memory variables in the PLC. In this application the Adroit software is used more as an HMI than a typical scada system, and communicates with tags in the Allan Bradley PLC via PCIP. The PLC in turn connects to four ABB robots, a shot peener and defector machine. The set-up also allows for the future addition of an interface with the coiling machine. 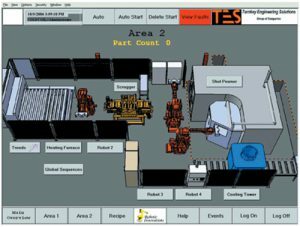 The systems integrator (SI) and robotic supplier have split the manufacturing process into two areas on the HMI, with the cold coiling machine linking the two sections. In this way, faults can be identified more readily. The line starts with a straightening process. Previously metal was supplied in the form of rods, but with the cold coiling method it is now delivered in reels. From the straightening line the raw material passes through a defector to test end loads, and then onto a sliding table. Manual labour is used to off-load the springs onto the sliding table. This is the only place on the line that is not automated. The second area has auto-starters for its components; these includes the peener, scragger, three robots and the cooling tower. The robots are connected via a Buslink network. The oven has its own controller that the Adroit system monitors and logs because of its critical importance in the process. The scada enables the operator to view sequentially each step in the process. Each component can be more closely viewed by clicking on the image on the touch-screen. Next, the feedstock is put through a tempering furnace to release mechanical stresses. Stress testing is a critical element of coil production, and using the hotshot peener at temperatures of approximately 300°C the manufacturer is able to get a better penetration depth of the tiny blasted steel particles. The system also has relay logic between the peener PLC and the scada PLC. The function of the scragger is to compress the spring to give correct tension. This is one of the most crucial stages of the process. Using this automation system the company can achieve high production accuracy. Cold coiling offers many benefits over the old hot coiling system. It eliminates lengthy repair times and dramatically reduces human error, with only two to three people required to work on this almost entirely automated line, versus five personnel for the hot coiling system. The new cold coiling line also boasts a significant reduction in the amount of scrap. The scada system automatically monitors and logs the coils’ press distance for load testing and controls reject at the load testing stage. Coils that fall below the specified parameters are automatically rejected as scrap, while those that fall above the parameters are automatically sent to the second scragger, which reworks the spring to the desired parameters, thereby reducing scrap. The SI configured the Adroit system with security levels that record who is logged on to the system and what changes they make. User security is integrated into the event viewer, to ensure product quality, and provide a paper trail of faults and the responsible parties. The Adroit scada provides datalogging for each load, as well as for all heating and furnace temperatures. The operator can retrieve and view these statistics or draw down on them as far back as six months for reporting purposes. “We also selected the Adroit soft licence over that with the dongle because it comes standard with a touchscreen,” the SI explains. The 17-inch touchscreen forms the sole workstation on this line and is used with Adroit tag licences. Graphics were created in a computer-aided design type program and incorporated in the scada giving them a realistic 3-dimensional feel. The SI also compiled a comprehensive online help function to ensure that the operator gets maximum utility from the system. The Adroit Marshall Agent enabled the SI to compress the number of tags used, without compromising on quality, and thereby reducing their total licensing costs. “We compressed a lot into the Marshall Agent to service 16 agents that are then decompressed in Adroit to the same tags,” says the SI. Two of the tags are also being used to export data to Excel – for use in graphs and reports. “The manufacturer, SI and Adroit have brought together their knowledge and expertise to once again prove that South African companies have the ability to deliver innovative solutions to the world’s challenges,” says Dave Wibberley, managing director of Adroit Technologies.